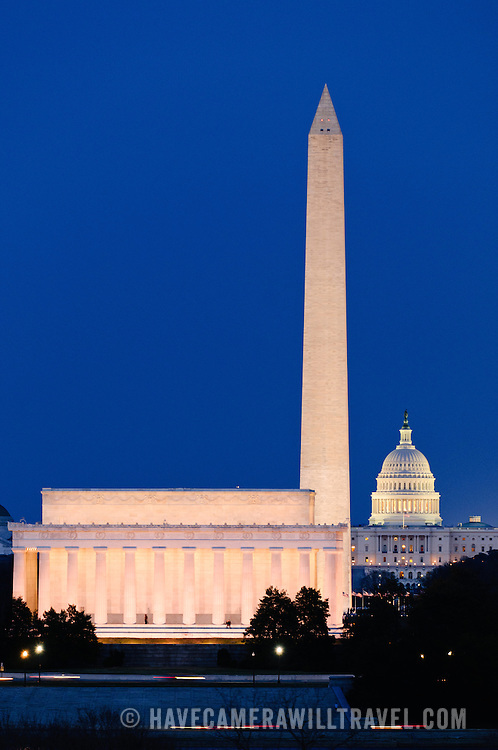 View of famous monuments along Washington DC's National Mall. From left to right (and foreground to background) is the Lincoln Memorial, Washington Monument, and US Capitol Building. The shot is taken from near the Iwo Jima Memorial in Arlington, VA, looking East across the Potomac River. The distance between the Lincoln Memorial and the US Capitol Building is 2.3 miles--the long telephoto lens used compresses the distance.